Beautiful certificate from the Confederate States of America issued on July 4, 1864 to J. H. Sands. 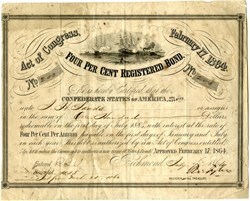 The bond was issued under the Act of February 17, 1864. $1000. No.4612. This historic document was printed by George Dunn & Company, Richmond, Virginia and has a border around it with a vignette of CSS Virginia sinking the USS Cumberland on March 8, 1862. This item is hand signed by the Register of the Treasury, Robert Tyler and is over 139 years old. Only 8842 issued. Light toning and foxing that can be seen in scan. At mid-day on 8 March 1862, CSS Virginia (formerly USS Merrimack, and persistently mid-identified by that name or as "Merrimac") steamed down the Elizabeth River from Norfolk and entered Hampton Roads. It was the newly converted ironclad's trial trip, a short voyage that would deeply influence naval opinion at home and abroad. Anchored on the opposite side of Hampton Roads were five major Union warships: the frigate Congress and large sloop of war Cumberland off Newport News, and the frigates St. Lawrence, Minnesota and Roanoke a few miles to the east, off Fortress Monroe. All were powerful conventional wooden men o'war. Minnesota and Roanoke, of the same type as the pre-war Merrimack, had auxiliary steam propulsion, but the other three were propelled by sails alone, and thus were at the mercy of wind conditions and the availability of tugs. As Virginia crossed the Roads, looking (as one witness described her) "like the roof of a very big barn belching forth smoke as from a chimney on fire", the Union ships called their crews to quarters and prepared for action. Turning west, the Confederate ironclad shrugged off steady fire from ships and shore batteries as she steamed past the Congress. Firing her heavy cannon into both ships, she pushed her ram into Cumberland's starboard side. The stricken ship began to sink, though her gun crews kept up a heavy fire as she went down. In the words of one of Cumberland's enemies, "No ship was ever fought more gallantly." Robert Tyler (1816-1877), the Registry of the Treasury, was a son of U.S. President John Tyler by his first wife. Tyler was head of the Democratic party in Pennsylvania and a personal friend of President James Buchanan before he had to flee to the Confederacy. Through his father's influence, he procured the post of Register of the Treasury, which he held from August 13, 1861 to the end of the war. After the war Tyler moved with his family to Alabama, where he became a newspaper editor. He also became the head of the Democratic Party in Alabama.